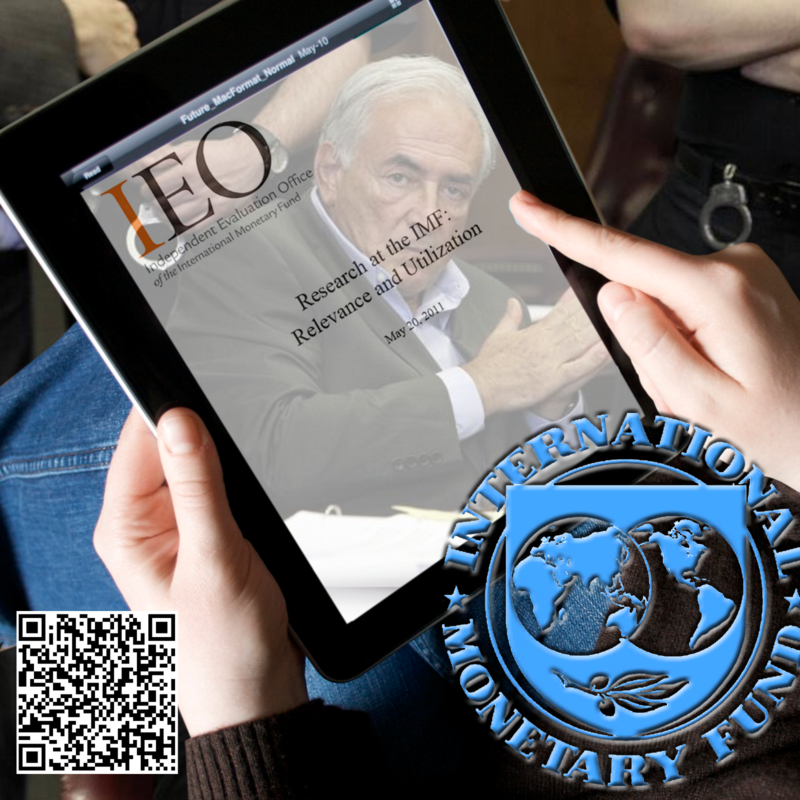 Click picture for bigger version and test the QR-code: tested with iPad 2 and 4 QR-code apps: QR HD, Scan, QRdeCode, Qrafter (the last one is the best as it zooms automatically and is a free app) It should bring you directly to the report of IEO "Research at the IMF: relevance and utilization." What both IEO reports omit, however, is that since 2008 the IMF’s official views have been moving away from the Washington Consensus. This began under the former IMF Managing Director Dominique Strauss-Kahn, a former socialist French finance minister, who chose his compatriot MIT macroeconomist Olivier Blanchard to be the IMF economic counselor and research department director (see my columns “The IMF’s evolving policy makeover” (1) and (2), published on Feb. 22 and March 1, 2010, respectively). In several recent publications the IMF has demonstrated its tilting to the left in economic policies by calling for higher inflation rates as well as greater financial regulation in developed countries and for capital controls in developing countries. We have to wait and see whether this tilting to the left will continue, creating an opposite research bias, under the IMF’s controversial new managing director, also from France. If she will be anything more than a mouthpiece for the international banking world is doubtful, if her method of public broadcasted optimism is enough to quell the financial crisis is most unlikely. The commentator on ‘Rue 89’, the economist Jean Matouk, precises in his article (*) the actual government measures, 4,7% augmentation for the minimum elderly income and 2% for the pensions. Matouk tells us in a sarcastic tone also to what it boils down: “16 Euros more pro month. What is she moaning about?” The next question to Finance Minister Lagarde from radio listeners make her jumps from tens of Euros to milliards, as the support for Greece and other “weak economies” in Europe and its financial consequences are brought in. I will not cite the whole interview here, details are on-line in French, but what is striking, is the correlation between the way the poor pension lady is helped by Lagarde and her world of high finances and the way ‘global economy’ is handled by the same forces. (*) Vivre avec 800 € par mois quand les banques enfument le monde (‘Living on 800 Euros a month while the banks smokes up the world’; there is a double meaning here in ‘enfumer’, one of a smoke screen, the other of something being fucked). (**) For details on the Wall Street bull of Di Monica see Wikipedia.